After many years in the wilderness, these are good times to be a Manchester City fan. Last season their team recorded its best ever performance in the Premier League by finishing third, thus qualifying for the Champions League for the first time, and won its first major trophy for 35 years when defeating Stoke City in the FA Cup final. 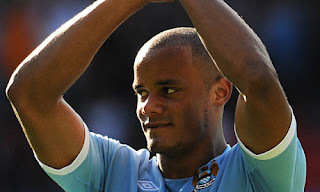 Their momentum has continued this season (at least on the domestic front), as they lead the Premier League by five points after a series of impressive victories, including an astonishing 6-1 triumph against local rivals Manchester United at Old Trafford, and have reached the semi-finals of the Carling Cup. However, they have found life more difficult in Europe, where they now have to rely on others to avoid elimination at the Champions League group stage. Nevertheless, the force appears to be with the Citizens, boosted by the £800 million or so that Sheikh Mansour has invested since his Abu Dhabi United Group bought Manchester City three years ago. Quite simply, this is a club transformed. Of course, that is most clearly seen in the huge amounts of money spent on recruiting new players, which has had a dramatic impact on the club’s performance, both on the pitch and on the financial side of the “project”. In fact, they have just announced the largest loss in English football history of £197 million, which easily surpassed the previous record of £141 million reported by Chelsea in 2004/05, the first full year after the acquisition by their Russian benefactor Roman Abramovich. In fairness, £34 million of the deficit was due to exceptional items that should not be repeated in future seasons, but the loss would still have been a hefty £163 million. 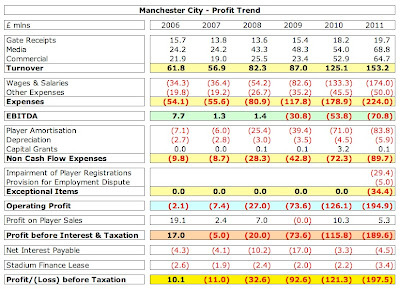 Admittedly, most football clubs are loss-making with only 4 of the 20 Premier League clubs registering profits in 2009/10, but few have burned through the cash like City, who have accumulated losses of £411 million in the last three years: 2009 £93 million, 2010 £121 million and 2011 £197 million. This is not quite unprecedented, as Inter suffered aggregate losses of around £440 million in the three years between 2007 and 2009, but it’s rare for large clubs to lose this sort of money. Bayern Munich and Real Madrid are consistently profitable, the German club reporting profits for an incredible 19 years in a row, while even Manchester United managed to make money last year, despite the significant interest burden on the loans taken out by the Glazers. However, perhaps the closest equivalent to City are Chelsea, whose wealthy owner also chose to aggressively splash money on talent in a bid to compete with clubs that generate more revenue. Here there is some encouragement for City’s financials, as Chelsea have managed to reduce their losses over the years – though they are still a long way from break-even. The main reason for City’s increasing losses is the investment in the playing squad, which is at the core of that “accelerated recruitment process.” As an example, the 2010/11 figures reflected the signings of Yaya Toure, David Silva, Mario Balotelli, Aleksandar Kolarov, James Milner, Jerome Boateng and Edin Dzeko for the first time. This acquisition policy has resulted in the wage bill more than tripling since 2008 from £54 million to £174 million, again the highest ever recorded in English football, just above Chelsea’s £173 million in 2009/10. Similarly, player amortisation, namely the cost of writing off transfer fees over the length of a player’s contract, has also grown by more than 200% in the same period from £25 million to £84 million. As would be expected, the important wages to turnover ratio has also been rising (deteriorating) from a respectable 66% in 2008 to 114% last season. Although some Premier League clubs with very low revenue also have uncomfortably high ratios, City are the only club where the wage bill actually exceeds turnover – and by a whopping £21 million. As a comparison, England’s other Champions League qualifiers have much lower ratios: Manchester United 46%, Arsenal 55% and Chelsea 82%. The good news is that City’s revenue is rapidly growing, increasing by 22% in 2011 alone from £125 million to £153 million, breaking through the £150 million threshold for the first time in the club’s history. All revenue streams rose: gate receipts by 8% from £18 million to £20 million; media by 28% from £54 million to £69 million, partly due to success on the pitch, including good runs in the FA Cup and Europa League, and partly due to the new Premier League TV rights deal; and commercial income up 22% from £53 million to £65 million. 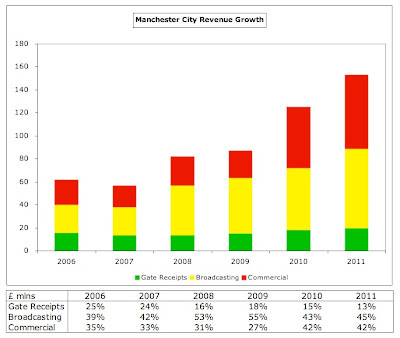 City’s commercial operations have been the engine driving their growth with revenue surging from £23 million to an impressive £65 million since 2009, mainly due to the impact of new partnerships with Etihad Airways, Umbro, Aabar, Abu Dhabi Tourism Authority and Etisalat, though the new retail agreement with Kitbag has also contributed. City’s commercial income is now only second to Manchester United in England, though Liverpool and Chelsea may have also advanced in the last financial year (accounts not published yet). 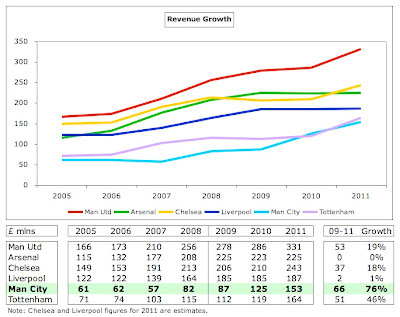 What is clear is that City’s revenue growth has been explosive compared to other clubs. Since 2009 their revenue has increased by an amazing 76% (from £87 million to £153 million) with Tottenham the only leading English club to come anywhere close with 46%, almost entirely due to their participation in the Champions League last season. Manchester United and Chelsea achieved a decent 19% and 18% respectively, though were left in City’s slipstream, while Arsenal and Liverpool barely grew at all. Even before this year’s growth, City had established themselves as one of Europe’s elite in terms of revenue, rising to 11th in Deloitte’s 2009/10 Money League with £125 million. That’s no mean feat, yet, paradoxically, only serves to emphasise the magnitude of City’s task, as the leading clubs generate significantly higher revenue, e.g. last year’s top five earned as follows: Real Madrid £359 million, Barcelona £326 million, Manchester United £286 million, Bayern Munich £265 million and Arsenal £222 million. While it is true that City’s revenue has since grown to £153 million, the problem is that the revenue is still growing apace at many of the top clubs. Manchester United have advanced to £331 million in 2011 on the back of significant commercial deals, while the Spanish giants have also reported substantial gains in 2011: Real Madrid to £417 million and Barcelona to £392 million. City’s position in the Money League is even more impressive if you consider that they are the highest ranked of the clubs that did not qualify for the Champions League, a failing that they have obviously resolved this season. The importance of this additional revenue to a club’s finances cannot be over-stated, as seen by the sums earned in Europe last season by English entrants. The four Champions League qualifiers received an average of £35 million in TV money, ranging from £26 million for Arsenal to £47 million for Manchester United, while City and Liverpool both earned just £5 million for their adventures in the Europa League. The revolution in the blue half of Manchester can be starkly demonstrated by their activity in the transfer market, where they have massively outspent the other leading English clubs in the last five years. In fact, their net spend (purchases less sales) of £440 million is more than the combined net spend of the other five leading clubs: Chelsea £149 million, Liverpool £68 million, Manchester United £53 million, Tottenham £52 million and Arsenal (net sales) £29 million. 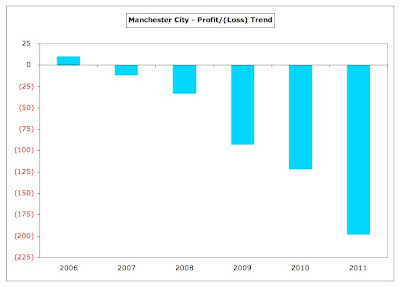 Up until the recent injection of funds, City had actually been a selling club with net sales of £5 million in the five years up to 2007. However, last season the club reduced its activity in the transfer market with net spend of “only” £57 million compared to over £100 million in each of the three preceding years. However, City’s former chief executive Garry Cook never seemed too concerned, “We have a very open dialogue with UEFA. We have had several meetings with them and they are very supportive of our plans.” This is a theme echoed by Graham Wallace, “As we undertake the club’s commercial transformation, we are cognisant of the incoming UEFA Financial Fair Play regulations and consequently we continue to maintain positive and ongoing dialogue with all appropriate football authorities.” As the actor Bob Hoskins used to say in the BT advert, “It’s good to talk”, but what does FFP mean in practice? The first season that UEFA will start monitoring clubs’ financials is 2013/14, but this will take into account losses made in the two preceding years, namely 2011/12 and 2012/13, which means two things: (a) the £197 million loss in 2010/11 is not relevant for the FFP calculation; (b) City’s accounts need to be in better shape pretty quickly. However, they don’t need to be absolutely perfect, as wealthy owners will be allowed to absorb aggregate losses (so-called “acceptable deviations”) of €45 million (£39 million), initially over two years and then over a three-year monitoring period, as long as they are willing to cover the deficit by making equity contributions, which is a fairly safe assumption in the case of Sheikh Mansour. The maximum permitted loss then falls to €30 million (£26 million) from 2015/16 and will be further reduced from 2018/19 (to an unspecified amount). Note that these sums represent aggregate losses, not a yearly loss. 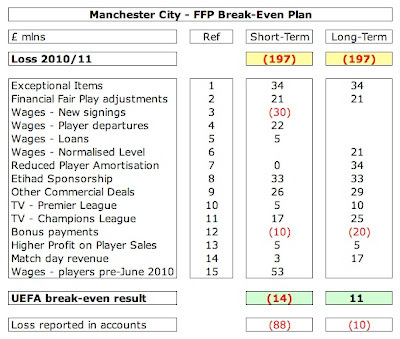 Clearly, City have a long way to go to reach break-even, but it’s not completely out of the question, as we shall see from the 15-point plan below, which looks at how City can improve their finances both in the short-term (over the next two seasons) and in the long-term, starting from their current pre-tax loss of £197 million. It should be noted that this plan is not necessarily a prediction of City’s next set of financials, but merely an example of how they could substantially improve their figures. A number of assumptions have been made particularly regarding transfer fees and salaries, which are notoriously untrustworthy even though they are widely reported. Nevertheless, any minor inaccuracies should not materially affect the principal conclusions. The 2010/11 loss included £34 million of exceptional items, comprising £29 million for the impairment of player registrations and a £5 million provision for a “disputed employment costs settlement”, which is not explained, but probably relates to the departure of former manager Mark Hughes and his coaching team. Impairment is an accounting term for reducing the value of players in the books, as the club decides that they are no longer worth so much. Although the names of the players are not divulged, my guess is that this relates to those players who were released for free (namely Craig Bellamy and Jo) and those who are unlikely to command a fee in future, due to their high wages (e.g. Roque Santa Cruz and Wayne Bridge). My calculations suggest that writing the value of those four players down to zero would have cost almost exactly the £29 million impairment charge. In any case, such charges by definition should not be repeated every year. Similar treatment might be required for Carlos Tevez and Emmanuel Adebayor, though their net book value in the accounts is probably now low enough to be covered by reduced transfer fees. It is not generally appreciated that UEFA’s break-even calculation is not exactly the same as a club’s statutory accounts, as it excludes certain expenses, including depreciation and finance costs on tangible fixed assets plus expenditure on youth development and community development activities. In City’s case, this means that £6 million of depreciation can be removed right off the bat. Finance costs are not so clear, but I have also excluded the £3 million charge on stadium finance leases, though I have not considered the £5 million interest charge, as the link to tangible fixed assets is not clear-cut. It is also difficult to assess the youth development expenditure, as this is not separately disclosed in the public accounts, but we can make a reasonable estimate of £10 million based on similar reviews of other clubs. The formation of the Elite Development Squad plus other investment in the academy should easily justify such a sum. In addition, I have excluded a notional £2 million for community development, which may be a little conservative, given City’s strenuous efforts in this area. Therefore, in total, the Fair Play rules allow City to reduce their expenses by £21 million: £6 million depreciation, £3 million stadium finance lease charges, £10 million youth development and £2 million community development expenditure. The 2010/11 accounts do not include the cost of any new signings after 31 May 2011, which means that we need to add the wages for Aguero, Nasri, Clichy and Savic. 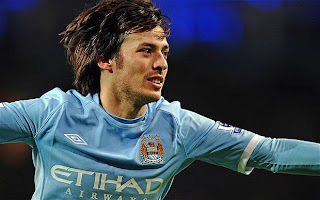 Taking Nasri as an example, his wages have been estimated at £150,000 a week, which works out to £8 million a year. In addition, Dzeko joined in the January 2011 transfer window, so the last accounts did not include a full year salary, meaning the remainder has to be added to future years. Although players’ salaries are not divulged, we can make reasonably accurate estimates, giving us a total of £30 million increase in the wage bill. On the other hand, six high-profile players left this summer, namely Jerome Boateng, Jo, Shay Given, Shaun Wright-Phillips, Craig Bellamy and Felipe Caicedo, which should have removed around £22 million from the wage bill. It is true that Bellamy and Caicedo were on loan last season to Cardiff City and Levante respectively, but rumour has it that the vast majority of their salaries were still covered by City, so that should not be too much of a factor. One consequence of City’s large squad is that they loan out many players to other clubs. Although this also happened last year, it is clear that this policy has been ramped up this season with the annual report noting that the club have “successfully loaned out 22 players.” Therefore, it seems a fairly safe assumption that this has taken a further £5 million off the wage bill. Note that I have not included Adebayor (loan to Tottenham) or Santa Cruz (Betis) in this calculation, as they will be covered by a later point (15). As a result of City’s accelerated acquisition of players, their wage bill has surged to £174 million. As recently as 2008, this was lower than Chelsea, Manchester United, Arsenal, Liverpool and Tottenham, but has overtaken all of them in just four years. However, there are three reasons to expect this to fall in future: (a) City should be able to offload those fringe players who are unlikely to feature for the first team again and are thus surplus to requirements, notably those bought during the Mark Hughes era, such as Adebayor, who would save nearly £8 million alone. (b) Up until recently, City have had to pay a premium to attract players from more established clubs, but a period of success should remove that. (c) More players should progress from the academy. In theory, the wage bill could be slashed, but I have conservatively assumed a reduction long-term of £21 million to £153 million to be in line with Manchester United’s latest figures, though well ahead of Arsenal’s £124 million. Chelsea’s last reported 2009/10 figures of £173 million are out of date and likely to fall, as the departure of many high earners should have offset the arrival of new signings. When a player is purchased, his costs are not immediately booked to the profit and loss account, but they are capitalised as an asset and written-off over the length of his contract, so there will be a cost impact for a few years. As an example, it was reported that Sergio Aguero was signed for £35 million on a 5-year contract, so his annual amortisation is £7 million (£35 million divided by 5 years). The impact of signings and departures in 2011 on the next accounts can therefore be reasonably estimated and works out to an increase of £20 million for new arrivals less £14 million for those leaving. However, City have also been quite astute with their impairment in 2010/11. If I am right in my assumption that they have written-down the value of Santa Cruz and Bridge to zero, that means that there is no more amortisation for those players, reducing the annual charge by £6 million. Adding together all the adds and drops suggests that the player amortisation will be more or less unchanged next year, though it should fall over time as players come to the end of their contracts, especially if City continue to lower their activity in the transfer market. There is an obvious precedent for this, as Chelsea’s player amortisation decreased from £83 million in 2005 to £38 million in 2010. One incentive for City to sell Tevez at a bargain price is to remove his player amortisation from the accounts, which could be worth as much as £9 million a year. Another policy that I would expect City to apply is to extend player contracts, as any remaining written-down value is amortised over the extended period, which means that the annual amortisation will reduce. For example: a player is bought for £20m on a 4-year contract, so the annual amortisation is £5m. After 2 years, his contract is extended by a further 2 years, meaning that he now has 4 years left on his contract. At the point of renegotiation, his value was £10m (£20m cost less 2 years amortisation at £5m). The new amortisation charge would be £2.5m a year (the remaining £10m divided by the 4 years now left on the contract). My assumption is that in the long-term City will manage to lower player amortisation by £34 million from £84 million to £50 million, which is still 25% higher than other leading clubs (Liverpool £40 million, Manchester United £39 million and Chelsea £38 million). The astonishing 10-year sponsorship deal with Etihad Airways was not included in last year’s figures and will have a major impact. The financials have not been divulged, but a range of £350-400 million has been widely reported. Given City’s need to improve the figures, I shall assume the higher figure, which means £40 million a year. Again, the split of the deal has not been published, but in an earlier piece I assumed that the shirt sponsorship is worth £20 million a year, the stadium naming rights £10 million and the campus another £10 million. UEFA have yet to decide whether this deal falls foul of their “fair value” ruling, but it is my belief that this will be passed. In any case, even if UEFA rules that City’s deal is above fair value, it is only the excess that would be deducted from the club’s income for the purposes of the FFP break-even calculation and not the entire agreement, so if the deal is worth £40 million a year and UEFA consider the fair value to be £35 million, only £5 million would be deducted. 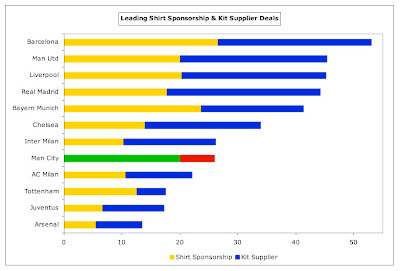 As Etihad already pay £7.5 million for shirt sponsorship, the uplift would be worth £32.5 million. City have already gone great guns in increasing commercial income, adding partners like EA Sports, Mansion Group, Thomas Cook, Jaguar and Heineken, but are gearing themselves up to really boost this activity, e.g. by establishing a permanent office in London in a bid to emulate Manchester United’s record-breaking performance here. Recently, the national media reported that they were set to agree a new £200 million kit deal with Umbro at the end of the season. Even though they are only three years into a 10-year deal, City’s progress means that this can be reviewed and there is talk of a significant increase in the annual payment from £6 million to £26 million. This might seem outrageously high, but is on a par with the sum Umbro already pays for the England team and is around the same level as the sums received by Liverpool from Warrior and Manchester United from Nike (though the latter is likely to rise to £35 million). As well as the £20 million increase from Umbro, I have assumed four more secondary sponsorship deals at £1.5 million a time, which would produce another £6 million, giving a total increase of £26 million. In the long-term, I have been very cautious by only adding a further two secondary deals (worth £3 million), giving long-term growth of £29 million. That does not include any potential clauses for increases in sponsorship deals from competing in the Champions League. Nor have I attempted to assess any additional commercial revenue from City’s ambitious Etihad Campus development. One of the reasons for City’s revenue growth last season was an additional £6 million from the Premier League, giving £55 million, mainly due to the substantial increase in overseas rights for the new three-year deal. 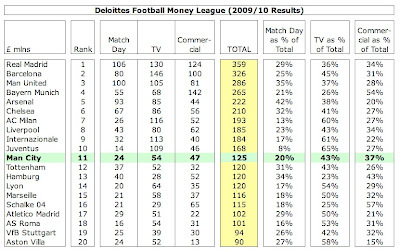 At the top of the league, there’s not an enormous financial difference between finishing places, due to the equitable nature of the distribution methodology. Each club gets an equal share of 50% of the domestic rights (£13.8 million) and 100% of the overseas rights (£17.9 million). However, facility fees (25% of domestic rights) depend on how many times each club is broadcast live, and this was worth £10.2 million. Finally, merit payments (25% of domestic rights) are worth £757,000 per place in the league table (£13.6 million). 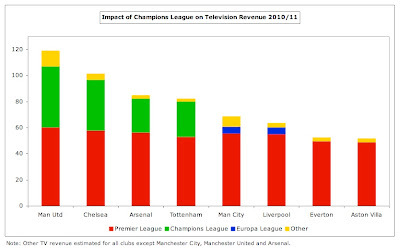 However, if City were to maintain their current first place and be shown more often live on television, they would receive around £60 million, i.e. an increase of £5 million. In the long-term, it is likely that TV rights will be worth even more, but again I have been conservative by only assuming an additional £5 million, partly because it is unlikely that City will win the Premier League every year. Last season the lowest sum received by an English club in the Champions League was €30 million (£26 million) for Arsenal, who were eliminated in the last 16. I have assumed that City do not make it out of the group, so will not receive the €3 million performance prize for the last 16 and will receive less money from the TV pool, working out to €23 million. I have also added €2 million for money earned from dropping down to the Europa League, giving a total of €25 million (£22 million), which is £17 million higher than the £5 million earned last season in the Europa League. In the long-term, I have assumed that City will be more effective at European level and earn £30 million, which would represent growth of £25 million. Of course, if they were to reach the final, that would be worth at least £45 million. The price of success on the pitch is higher bonus payments. Frankly, this is impossible to accurately estimate without knowing how much was paid last season (but this is not separately analysed in the accounts) and each player’s remuneration scheme, so I am only going to include a placeholder of a £10 million increase in the short-term (up to £20 million in the long-term). This may be on the low side. City made £5 million profit on player sales in 2010/11, but it is not unreasonable to assume that they could make £10 million a year from this activity, especially if the academy really starts to deliver. According to my calculations, that is what they should gain in 2011/12 (assuming that the value of Bellamy and Jo was impaired). 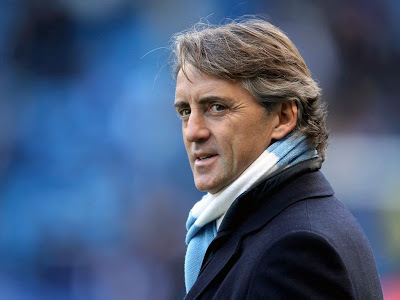 Even though there is a temptation to get players off the wage bill, Roberto Mancini has argued that the club should not let players leave for nothing, “They are good players and if there is a club that wants one of them, they must pay.” That might be bravado, but even if players are sold for a cut-price fee, there may well be a resulting profit after cumulative amortisation is taken into consideration. Of course, City could easily raise significant funds by selling the likes of Silva, Yaya Tore and Balotelli, but that sort of defeats the object. City’s Achilles’ heel is their very low match day income, which is only £26 million (gate receipts plus re-allocation from commercial revenue per Deloitte Money League). This works out to around £1 million a match, which is very low compared to Manchester United £3.7 million and Arsenal £3.3 million. It’s not just a question of stadium capacity either, as Chelsea and Liverpool earn £2.4 million and £1.6 million, even thought their grounds are smaller than City’s. City have partially addressed this shortfall via a new agreement with the council, whereby the club pays them a fixed amount regardless of the attendance instead of the previous percentage, but there is surely room for further growth. This might mean raising ticket prices, increasing the corporate seats or expanding the capacity of the stadium. The first two moves would be unpopular with fans, though a logical ghastly consequence of FFP, while the stadium expansion would be longer-term in nature. Plans exist to increase the capacity of the stadium from 48,000 to at least 60,000, but this would not be entirely straightforward, due to its awkward design. There have been some concerns that City would struggle to fill a larger stadium, even though their attendances have always been good (4th highest in the Premier League), but this season their crowds have been virtually at full capacity (99%). Given the higher attendance, especially in Europe, I have assumed a 10% (£3 million increase) in the short-term, while a reasonable long-term aspiration would be to match Liverpool’s match day revenue of £43 million, as the grounds have similar capacity and both clubs operate in the north-west of England (as opposed to the wealthier south), resulting in growth of £17 million. The small print in the FFP regulations (Annex XI) states that clubs will not be sanctioned in the first two monitoring periods, so long as: (a) the club is reporting a positive trend in the annual break-even results; and (b) the aggregate break-even deficit is only due to the 2011/12 deficit, which in turn is due to player contracts undertaken prior to 1 June 2010. In other words, City would be allowed to exceed the “acceptable deviation” of €45 million by the costs of pre-June 2010 signings, so long as the 2011/12 deficit was only due to this factor. Assuming that this clause refers purely to wages (and does not include player amortisation), I have calculated this cost for “big name” players to be £53 million. 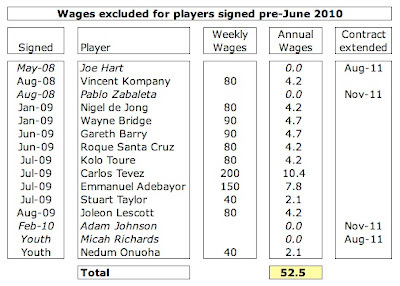 Note that players whose contracts have been extended since 1 June 2010 are not counted (as explicitly noted in the regulations), so I have excluded Joe Hart, Pablo Zabaleta, Adam Johnson and Micah Richards. This might explain why City are delaying extending contracts for the likes of Vincent Kompany and Nigel De Jong. 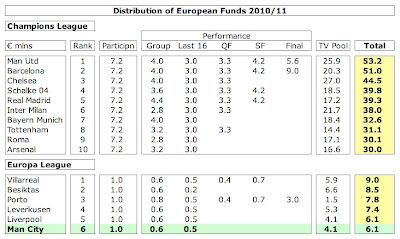 In truth, this still does not completely satisfy the condition that the entire 2011/12 break-even deficit is due to these costs (unless player amortisation is also considered), but it is so close that my guess is that UEFA would look favourably upon this, especially if the trend was going the right way. So, there you have it, Manchester City’s loss could come down to £88 million (still enormous), but for the purposes of FFP this would represent a break-even deficit of only £14 million. This is clearly by no means a done deal, but if they achieved that in the short-term, it would be extremely difficult for UEFA to throw the book at them. As a comparative, Manchester United’s current revenue is £331 million, but we know that this will increase, again largely due to commercial gains, so City’s revenue projection is aggressive, but not unrealistic. In any case, many believe that UEFA will never throw a leading club out of their competitions, as this would be the equivalent of biting the hand that feeds. Their General Secretary, Gianni Infantino, talks a good fight, “We will apply these rules strictly in order to safeguard the future of our game”, but exclusion is considered to be very much a last resort only to be applied to repeat offenders. However, UEFA will be acutely aware of the threat of legal reprisals. As Arsenal manager Arsene Wenger, a staunch supporter of FFP, forlornly commented, “With what happened with Sion challenging UEFA, they have lost a lot of power.” A sliding scale of sanctions is set to be announced in January, to be ratified by UEFA’s congress in March, and is likely to feature a number of financial penalties, including fines and the withholding of participation money, and potentially transfer bans (though even these could be challenged as being a restraint of trade). "Baldrick, I have a very cunning plan"
This is completely aligned with UEFA’s objectives, as are the community benefits from the ambitious plans to regenerate the local area. Andrea Traverso, UEFA’s head of club licensing, has already visited the Etihad Stadium for a briefing on City’s intentions and he surely won’t be the last to be given the grand tour. Anyhow, it’s by no means an impossible dream for City to get close enough to break-even in order to satisfy FFP. It’s not quite the Masterplan that their famous fans, Oasis, once sang about, but it’s a smart strategy that has every chance of succeeding – as long as the team continues to do the business on the pitch. Another top post as ever! I have no doubts at all that City will pass the FFP. They know the regulations and I'm sure they have very well paid accountants who will massage the figures enough to ensure they do meet the regulations. The Etihad naming deal is also evidence of that, was that questionable? Very much so, but again that was constructed with the new rules in mind (the campus etc...) so the details were such that if UEFA did look at it, they would be unable to do anything about it. City spend a lot of money to become regular diners at the top table before rules come in to prevent any English club from ever doing it again. Have you only just heard? Great write-up. 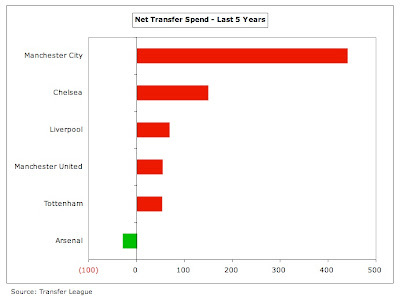 Very interesting to see the ins and outs of FFP applied as such. My only qualm is that it seems to be a bit of a stretch to consider that the monetary balance of players staying and leaving will go in City's favor. There will be players who go out of favor and must be sold/let go. Even after amortization, these players will have to go for a loss (as you discuss). Even with the most favorable assumptions for City, the club will be walking a thin line regarding FFP. Though the club's recent (and likely future) performance will provide a draw for players, having to claw back to stability will leave the club with very little room for bids attractive enough to compete with more stable clubs like United and Arsenal. The only outcome I can see as a result is a reliance on academy players as replacements because there will be no room for any losses or spending. Seems to me like this "masterplan" is no more than the best means to correct gross mismanagement. fifa only did this to protect the so called elite when this was first dreamed of luckily city got in just in time unfortunately it will never help the lower clubs gain big investors to make there club great,i honestly cant see any lower club being able to do what city has done ever again. Thank you for another brilliant and insightful pieces on Football and its financial workings. I am disappointed how the so called best managed club in the world, my beloved Arsenal, has failed to capitalise on their consistent performance in PL and CL and have a relatively meagre commercial income. I hope the board are able to remedy it or it will only become increasingly difficult to walk apace. The protection of large clubs in this way goes against any sense of natural justice. The link of costs to revenue means that it is not worth potential new benefactors of small clubs trying to break in. In no other world does this happen. It is a bit like stopping Virgin from breaking into the train market dominated by the old players with their dilapidated rolling stock. I think for me the disappointment is that UEFA has effectively closed the doors for any other club that can attract the investment, to do what we have done with City. I know people decry it as being unfair - but life is unfair. And in business, as in life, investors see an opportunity and leverage it for their best potential outcome. That can no longer happen. We will have the Champions League teams and "everybody else". It is grossly unfair and should be challenged in the courts. I am all for well run clubs. But to insist that a club HAS to be self sufficient and not raise money through external investment is preposterous. It is also a situation that does not exist elsewhere. I tend to agree with some of your projections but and it's a massive BUT, I think your estimates for wages both in the short and long term are extremely unrealistic and it will be this factor which ultimately makes it impossible for City to pass Uefa's FFP regulations. 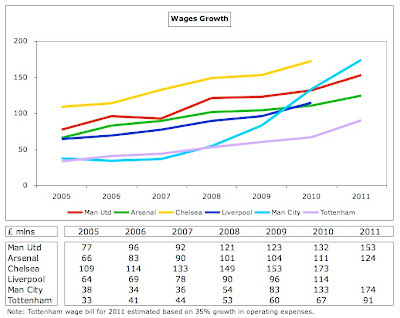 I note that this time last year you projected the 2010/11 wage increase to be £20m when in actual fact it was £41m. I think your biggest oversight when looking at City's wages is that you don't make any allowance for the standard 'built-in' inflationary increases in the existing player's contracts. For a club like City this is likely to be in the order of 10-15% pa. On a related point I can't see any allowance for new contracts signed in this financial year (Hart, Richards, Zabaleta, A.Johnson with De Jong and Kompany likely to follow shortly). If I've calculated correctly you project City's 2011/12 wage bill to be £187m. I can state with a very high degree of confidence that it will in fact be north of £200m. The idea that under the current adminstration, City will reduce their wage bill to £153m in the years to come is just a complete and utter fantasy as far as I'm concerned. To say the doors will be closed to large investment in smaller clubs is inaccurate. Let's not forget that the majority of smaller clubs are completely unaffected by UEFA's regulations. If a new owner were to come in, invest a large amount of money, develop the brand to a point of stability, then essentially do what City will be forced to do over the next few years and balance things out, there is no reason that the club could not have UEFA aspirations, in time. What this rule does is eliminate the shortcut of tons of money and no sustainable development; hence forcing clubs to act as responsible businesses. When looked at from this angle, the benefits become a bit more clear. There is one thing I'm curious about. how are man city going to cut their wages to be in line with man utd's, when they pay so much more to their key players. ballotelli, nasri, aguero, dzeko, and silva are all roughly earning between 160,000 and 175,000 a week along with adebayor, with yaya toure and tevez earning even more than that. Only rooney is in that bracket at man utd. the impression I get is that even the lesser earners at city also earn more than their equivalents at man utd. So unless man city are going to have a considerably smaller squad than man utd, it is difficult to see how they are going to manage this trick. This would act as a buffer to allow more of the losses that the club will incur over the next monitoring periods to be absorbed somewhat- and if Arsenal did do this, then there is a precedent to keep our friends at UEFA happy. Such a tactic would be doubly sneaky because, as I understand it, infrastructure costs aren't covered under FFP? But if front loading is an accounting option, the club would be foolish not to take advantage of it. Good article, as we know the current uefa chairmen is trying to ringfence the old guard, meaning a mid table club trying to build itself into a larger club now has no chance whatsoever,if mr Platini really wanted to make football a better place then why not colaberate with his mate blatter and introduce an international wage cap? why not cap transfer fees? why not make all players pay their agents?, no matter where a player would move they would know they wouldn't get more money, this might inspire a bit of loyalty. The truth is Platini is a hypocrite, he slates city and on the other hand encourages the spending currently happening at psg,i for one hope city get the chance to ram it down his neck! Excellent writing - soccer journalism taken to a completely new level! I have recently read the PFF document from UEFA that you refer to and was quite simply shocked to see the vast discrepancy between this document and the grossly misapprehension of it that has been bandied about in the popular media, especially when it comes to Man City`s predicament. Aside from the fact that we all know that clubs will not be "abandoned" from the UEFA competions (this world simply do not work like this! ), I think that Man City and other big spending clubs can take this threat relatively easy. 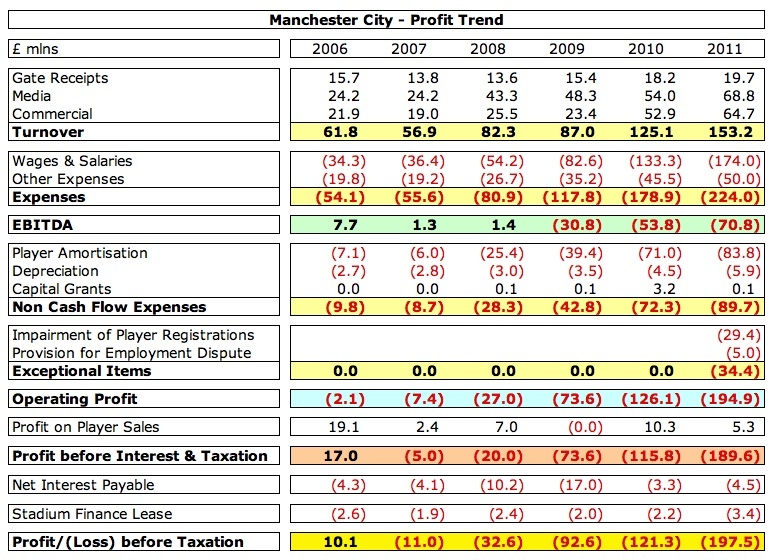 considerable profit if needed, and the squad is probably so strong that City still will be contenders for all trophys. * Match day revenue: Both my calculations and "instincts" tell me that this will surpass £ 50 millions already in 2013. Remember: Ticket prices at Etihad is still extremely low comapred to other clubs, and all costs connected with increasing the capacity will be "FFP-deductable". 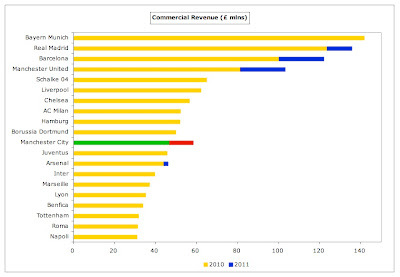 In fact, I feel quite sure that Man City will reach a total revenue at £ 2,5 bill. already in 2013/2014, with wages still on £ 1,5 bill. That implies a considerable amount for player amortisation and other expenses. We may even see a nice little profit! A wonderful piece of work - again! Well done. However, it still seems to me that there is no way City can comply with FFP rules, even if their revenue goes up as much as you say it can. They still have the problem of their expenses going up almost as fast. However, time will tell in that regard but the example of Chelsea, still reliant on their benefactor years after their years of high spending when Abramovich took over,is not promising. All that said, I would like to raise the issue of the 'exceptional expenses' of some £34m in their accounts. ...unless they decide to book a massive impairment provision in 2010/11 (the last year where the accounts are excluded from UEFA’s calculations), dramatically reducing the value of their players in the accounts and reducing future expenses. Now that City have carried out this exercise in bringing forward such expenses into last year's accounts, instead of waiting for them to crystalise as and when, is it likely that UEFA will disallow them from last year's accounts and add them onto later years as and when they actually arise? As you have also made clear numerous times, this year 2011/12 is the first year which falls under FFP rules. The consequence of City being eliminated at the group stage of the Champions League is that there will be a significant effect on this year's accounts, at least £10m reduction in anticipated income, and will increase the loss for this present year accordingly. A secondary point to consider is that one of their possible strategies to become FFA-compliant is to extend the contracts of players signed before June 1, 2010 so as to increase the period of amortisation and thereby reduce the amount of amortisation for the players concerned. However, as you also make clear, one other effect of such a strategy would be that the wages of these players, probably increased wages at that, would no longer be exempt from FFP. It seems City are stuck between a rock and a hard place in their squirmings to become FFP-compliant! Thanks. Yes, you're right, I did underestimate City's wage bill last year, but in fairness many of my other forecasts (made before many others) have come to pass, so it wasn't too shabby for an outsider. 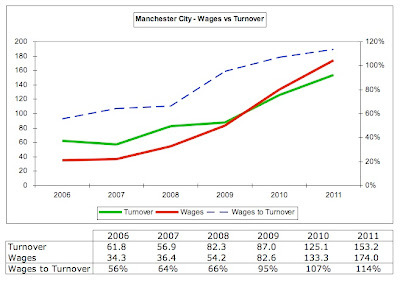 I absolutely agree that wages are the single biggest issue that City need to tackle, but there's a small oversight in your calculation, as my projections effectively assume a total wage bill in the long-term of £173m - using exactly the same reasoning as you applied to reach the short-term figure of £187m. Yes, I take your point, though I did actually state that the short-term covered the next two seasons. RS Brown, your comment shows that you misunderstand FFP rules. Nothing in FFP rules prevents a Russian oligarch who obtained his wealth by corruption or a petrol-soaked Middle Eastern sheikh from buying a football club and pumping billions into it. When such 'benefactors'arrive upon the scene and if they had the long-term benefit of their chosen victims (sorry, beneficiaries) at their heart, they would continue to pump their ill-gotten gains into whichever club they had chosen. For example, suppose some 'benefactor bought Everton. In the first couple of years, FFP would not apply as Everton would not be in contention for a top four finish in the EPL. Therefore, such a 'benefactor' could splurge vast sums on players and not have to worry about FFP. After a few years, Everton would be in contention for a top four finish but would not be eligible for European football - a small consideration for a 'benefactor' prepared to splurge a billion or more (probably more), as having to forsake some £40m from Champions League football money is mere peanuts to them. Therefore, the club in question, Everton in this case but it could be anyone, would have to wait some years until (supposed) massive investment in youth teams would provide the players at low cost to enable the supposed 'benefactor' to have a regular inflow of good young players to replace the expensive marquee signings of earlier years. Therefore, the FFP rules do not prevent a 'benefactor' from buying up a club. The FFP rules do prevent immediate immediate access to European football but if the 'benefactor' is sincere in his declarations that he is concerned about the local community etc. etc. then no problemo. All the 'benefactor' has to do is go without an injection of CL funds for a few years, until the products of the generously funded youth squad flow off the unending Barcelona-like production line. This would not affect the accounts. It would affect the cash-flow only, but not the accounts. Yes, City could benefit from a front-loaded 'sweet-heart' deal as they would receive the cash up-front (if that were the way the deal is structured). However, this would have no effect upon the club's finances as the revenue from this 'sweet-heart' deal is deemed to be payable over the duration of this deal. It is similar to the way transfer costs are dealt with. They are not charged to the accounts in the year the cash leaves the club's bank account but are charged over the duration of the player's contract. Similarly, the club has to include the revenue from these 'sweet-heart' deals over the duration of these deals, irrespective of when they receive the cash for these deals. Oh dear - City are top of the league and not only in the Premiership! Such a surprise to see City spent half as much again as Chelsea on agents' fees. 3.can city stay competitive with teh squad slashing you envisage? the team has three stars and no potential ones. the B team are not a £250m revenue team. 4. if creating the academies like arsenal and barca to generate one or two new players a year was possible why can't anyone else do it (and why will city suddenly be able to). city's problems like chelsea's now will come when this achieving crop wane, get bored or otherwise need replacing. If football fans are genuinely opposed to the concept of finance affecting football performance, then i have a suggestion. Why don't we take all commercial football revenue, ie every sponsorship deal, the tv money, every ticket sale, every replica kit sale, every beanie hat and half time pie, and split the resultant pot of money equally to all. Domestically at least, no one gets the advantage. I assume to do this the clubs as they stand would have to fold, so if leading players want to be involved we could also remove the free-market concept from player registration also. Do you want that? I'm looing quite specifically at you - rags, scousers, gooners and chesea fans. No? I didn't think so. In that case, cease your whinging, accept the blue moon rising and understand that what ADUG are doing is good for football, good for Manchester, and good for Britain. Take solice, chaps. Take solice. Swiss Rambler, here is an issue I have been thinking about in recent days - as you can see, it takes me quite a while before I reach a conclusion. In your various postings, you have shown that La Liga's earnings from non-domestic TV rights are paltry compared to the EPL's. Here is what I think: La Liga and the EPL are both the same as both have 20 clubs competing. Therefore, both have 380 games over the season. The big difference is that of the 380 La Liga games, there are only two games which anyone outside Spain wants to watch, namely the two La Liga games between Real Madrid and Barcelona. By contrast in the EPL, there are, this season at any rate, seven teams in contention for a top four finish. The maths goes like this: Any top seven club plays the other top seven clubs 12 times, six times home and six times away. Disallowing this, each of the other top seven clubs plays each other a similar number of times. Therefore, if there are seven big clubs (Newcastle being this year's honourary inclusion), the number of games between top seven clubs is 12+10+8+6+4+2 = 42. A big difference, indeed! Twenty one times as many significant games as in La Liga. Yes, 'there be lies, damnded lies and statistics' but even so, there is good reason for the EPL to be worth far more in terms of non-domestic rights than La Liga. Compare two games compared to 42 games! Just one point - did you take into account the £40m (ish) right-off on failed City players in the yearly accounts. These players if sold for any money at all could generate substantial revenue. For example Adebayor should raise around £20m next summer if he somehow manages to maintain his 'new club' form for more than 5 months. I admit this will probably form City's summer transfer kitty next summer but I think the sum stated is important. Not sure where the Anonymous poster above is getting his figures from?!? 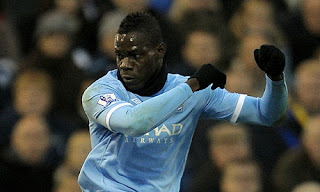 Dzeko, Silva, Balotelli, others on £160k-£175K a week apiece?!? Try halfing those figures, sadsac. the current year, principally related to the revised carrying values of intangible assets. Should any money be raised by sales or the release of wages due to players disappearing from the books then City will raise a considerable amount of money. TSR-excellent artlicle. Any chance you can put your mind to solving the national debt problems of the PIIGS? Please, can you follow up on Inter? It's a shame FFP will prevent clubs "winning the lottery" in the future like MCFC and if your not a top club (regular in the CL) in the next 2-3 ears, you never will be. After which we'll have a dull diet of the same old clubs year after year. What UEFA's problem with vast sums being injected into football from out side it? I fail to see how allowing greater financial inequality makes for a more competitive league. Sure FFP stops future investors from repeating Sheikh Mansour's revolution at City but unless we have 92 billionaires willing to fund their clubs in the same manner then there will always be a disparity. Sure, the PL has been dominated in the past by the likes of Manchester United and Arsenal but atleast that has been achieved through managerial talent as much as it has been through financial advantage. On the other hand starting with Chelsea we have seen a club maintain their dominant position through a succession of managers, just look at their bill last January when their top 4 position was under threat to see how. Would a self-sufficient club be able to spend such an amount to stop Spurs' challenge? Under FFP would Spurs have got that fourth spot? I think it's more likely that they would have had Chelsea not been able to purchase Torres and Luiz. Just ask any fan of a non-CL club who they believe they are more capable of competing with over the next few years, a self-sustaining club like Arsenal or a club with almost unlimited spending power like City. Atleast to me it's as clear as day what approach leads to a more competitive league. The FFP is far from perfect but without it a future where even Sir Alex is unable to put together a team to compete with Sheikh Mansours looks even more likely and if he can't who can? Then we are back to step one. As europe, and european football is bitten by recession, it's likely that a few high-profile teams will "do a Portsmouth" and become insolvent. I can imagine that, out of necessity, UEFA change their focus to encourage owners with money, and weed out the ones with debt. Interest rates are artificially low to avoid recession, but these will rise again to their normal level when the crisis is over, or to control inflation. When this happens, clubs will find it hard to refinance. Etihad now have those vital slots at Manchester airport, and they are fixed in peoples mind as a luxury brand. 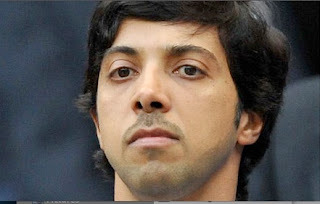 Sheik mansour is an investor in Mediaset (Silvio Berlesconi controls it with less than 35% ownership), so AC Milan are likely to continue signing City's expensive "ringers" like Robinho and Tevez. Finally, absolute weath corrupts absolutely. The UEFA "family" aren't above suspicion, and Abu Dhabi's sovereign wealth fund could bend the fabric of space / time itself. "The answers to your questions about City's finances are here Mr Platini, in this large briefcase. I'm going to look away for a moment now"
Blue Anorak, you raise a very good point regarding future income from transfers of players whose value was written down to zero in the accounts for 2010/11, some £29m. In an earlier analysis of City's finances, the Swiss Rambler himself stated that he thought such a bit of financial jiggery-pokery "would be blatant earnings manipulation and would not be accepted by UEFA". However, the point which you raise is just as significant, namely that the proceeds from selling these players this year or next would be pure 'profit'and would reduce the overall losses to a level lower than would otherwise have been the case. Mind you, Adebayor won't go anywhere if it involves a pay-cut. 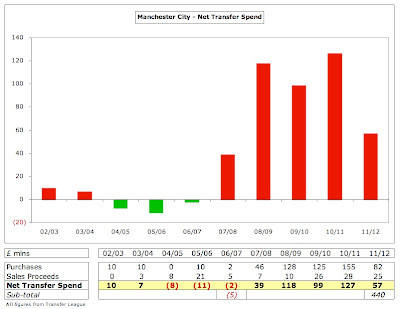 What happens with Tevez is in a different category as his value has not (yet) been reduced to zero in City's accounts. In any case, just how can you regard these 'exceptional costs' as being in any way exceptional when they arise specifically because of the club's transfer strategy of recent years. Indeed, if they arise for two or three years in a row, it is even harder to regard them as exceptional. However, City's wages bill for this year and next will fall by £6m as that is the amount which was due to Tevez as 'loyalty payments' for the duration of his contract. City informed Tevez that they were not going to pay him this 'loyalty payment' because late last year, and again this summer, he had said he wanted a transfer. What makes this particularly intriguing is that City informed Tevez of this decision only six days before the game against Bayern Munich, the game where Tevez refused to warm up! This has led to all kinds of tribulations for City since then, culminating with Tevez taking himself off to Argentina for almost four weeks where he is enjoying himself playing golf as well as acquiring himself a new girlfriend, an Argentina 'super-model', no less. It's hardly surprising he's in no hurry to get back to Manchester where, according to Tevez, there are only two restaurants. I don't think the acquisition of Torres had much bearing on Chelsea getting second place last season! Luiz was better, at least for a while, but even he did not get Chelsea into second place either. Instead, Chelsea's mid-season slump came to an end and they reverted to their normal league position of the last eight years, either first or second. It will be very interesting to see where Chelsea finish this season. There is a very real possibility (or should that be probability) that they will finish outside the top four - or even top five! The same fate awaits City in a few years time. The effect of their 'financial doping', in the immortal words of Arsene Wenger, of the last few years will eventually unwind, and the absence of the possibility of financial 'injections' on a similar scale in future will mean that City's dominance will be a short-lived affair, no more than a few years at worst/best. One of the most amusing incidents in football last season was when City were home to Lech Poznan. A few thousand Poznan fans travelled to Manchester for the game. They arrived into Manchester Central around mid-day and, having several hours to kill before the game, headed off to Old Trafford where they spend a bundle of cash buying stuff in United's Megastore. Utd made a killing out of that game (or Nike did, as they handle the merchandising apparently - but it should encourage Nike to boost their annual sponsorhip of Utd to much higher levels in a couple of years time!). The quality of what Swiss Rambler has to post here is unequalled anywhere! There is, literally, nothing like it anywhere in the football universe. It's just such a pity he's a Gunner. Dzeko £140k a week, Aguero £180k a week, Nasri £150k a week. 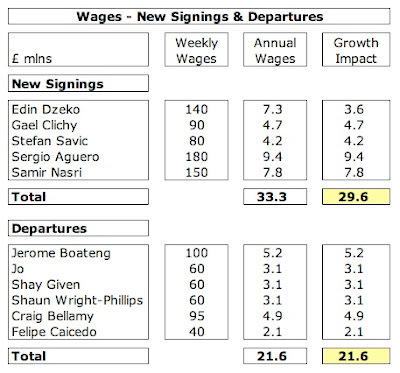 This shows the figures for Dzeko, Aguero and Nasri ranging from £140,000 a week to £180,000 a week. Your suggestion that these figures should be halved is not vindicated. Overall, these figures show the wages bill rising by £8m a year as a result of ins and outs. Of course, there are other factors affecting this year’s wages bill, such as bonus payments for winning the Premiership (if they win it), or for coming second instead of third, for example, and playing in the group stages of the Champions League instead of the Europa League. The upward pressure on wages is set to continue, that’s for sure. Swiss - I think yor're spot on when it comes to the fiscal reporting on City. They're not pouring out the money without a plan. One thing though. It's still football. And footballers. The ones earning close to 200 M £ a year are the ones who eventually are going to s***w it up. Vanity and money issues among the players will tear the sheiks busines apart. They won't be top six come may 2016. Would you like some hard cheese with those sour grapes? Any chance of some clarification regards player amortisation? Is the maximum figure and thus including unrealised performance related clauses included from the offset in the amortisation calculation or is it adjusted after that contingent requisite has been satisfied? Basically, could City's amortisation increase if every player they purchased had £2-3m going to the selling club if they won the league? City's best hope is that the big clubs in europe create a super league as liverpool has been campaigning for (unfortunately for liverpool they wont be in it) and create a European super league. The contract with fifa ends in 2014 so city may not even have to worry about FFP rules. Barca and real don't want to share all the tv revenue they extort from la liga. Other clubs wanting to break away would be chelsea, manu, paris saint germain, inter milan, anzhi, oddly enough it would actually also be in bayern munichs interest and the ESL was spoken about a while back by Rummenigge. I think this is more in line with Citys real plan!! One common feature of SR's analyses of clubs such as City, Chelsea and Inter is that he seems to think there is a pathway for each of them to become UEFA FFP-compliant. Speaking for myself, I see no way they can become FFP-compliant - ever. The latter observation, whilst true, is a long way from fruition. As for City, unless they produce quite a few more 'sweet-heart deals' with sundry other Abu Dhabi state organisations, it is impossible that they will reach break-even even under UEFA's definition of this status. Inter don't really show much sign of increasing their own self-generated revenues to the extent required to compensate for the abolition of owner-injected funds on the scale of the last ten years. Of course, all hell will break loose if the Euro collapses or if Spain has to leave the Euro. A resurrected Spanish Peseta would probably be worth a lot less than Spain's Euro. Spain's economy is not in great straits and both Real and Barca would no longer be able to pay such high wages as they do at present, as the value of the New Peseta would mean that they could no longer compete for top players when it comes to paying top wages. Any fan vested in his/her club's history, present, and future will know that success not earned definitely tastes less sweet. *Any* success City experience will only be deserved once the playing field is, by UEFA regulations, "level." Agree or disagree with that terminology, but City have done nothing in football terms that Chelsea haven't already done better and quicker. See where that has gotten them, with an ageing and overpaid squad and unable to compete (regularly, at least) with the transfer fees that they themselves were responsible for inflating. City's owner makes, to me, a good impression, but they are hardly a boon to the game as a whole. Guy Roux's Auxerre, Ajax, etc.- those are the class acts that it would be nice for City to try to measure up to eventually. But they are a long, long way at the moment. So sad to see such a proud Academy (City's) reduced to not even being a footnote for a few years. It would be amazing surely if, with all the finances at their disposal, City hadn't invested in to some expertise to negotiate with UEFA, understand the detail of the FFP regulations and, bearing in mind how it is done in the big corporate bodies, find the loopholes. As for UEFA it's one thing to say they may exclude a team but what if City were to be Premier League champions (not impossible) in the year they fell foul of the regs? Would they really exclude the Champions of a major league from a Competition called the Champions League? It would be quite an act of courage - something UEFA aren't famous for. And I wonder what their sponsors might say? Isn't it more likely that they'll accept promises of better financial behaviour in the future? It all boils down to City paying whomever a few million in baksheesh. Football is more about money than sport, thus a blog such as this exists. Sad really. Where is the Occupy Dubai crowd anyway? Seems like there are better ways to spend a billion pounds. 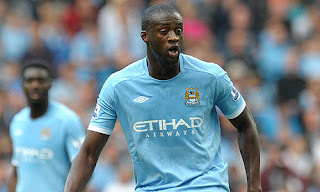 City's problem when it comes time to unload Adebayor and the ilk is who will assume the inflated wages? Who can really blame Bridge to golf each day Mancini? Tottenham - Grounds For Optimism Or Concern?